This brand new elegant condo is found in Alegranza Luxury Resort, one of the most exclusive communities on the serene residential golf course of San Jose del Cabo. 2BDMS is a gorgeous residence that features an En-suite Master bedroom with a king size bed, private bath with dual sinks, large tub, and a custom built in closet. The Second En-suite bedroom includes a king size bed, and dual sinks, and a custom built in closet. 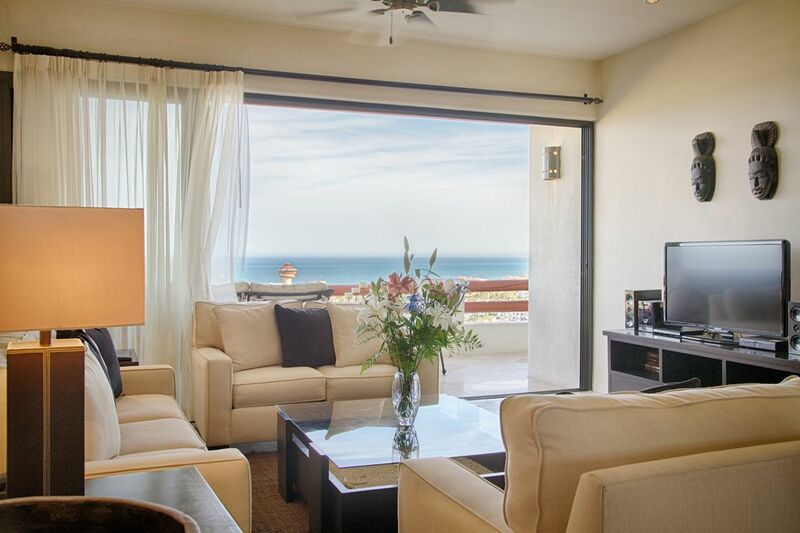 Both suites face the Sea of Cortez and offer mesmerizing views as well as a large private terrace. Among other features, this unit has top quality furnishings, 10 ft ceilings, granite countertops, alder wood carpentry, floor to ceiling double paned windows that provide complete noise and temperature isolation, washer and dryer, and a fully equipped kitchen with upgraded appliances. Located within walking distance to the beach, downtown San Jose (where you will find best shopping and restaurants in the area), supermarkets, ATM´s, the art district, and the Marina at Puerto Los Cabos. Alegranza Resort sits on the best hilltop location in San Jose del Cabo where one can appreciate the whole bay from Palmilla to Punta Gorda with unobstructed amazing views from every room. Loved being able to step away from the resort style vacation! We enjoyed having a little more quiet and the ability to cook. The king beds are much firmer than what I am used to but queen was a little softer. We spent most of our time on the patio, at the pool, or exploring! we thought we were getting this unit when we booked but were substituted a 3 bedroom (A503) when we arrived. this unit was not at all as advertised. It would possibly be a 2 star unit.The furnishings were dated, worn and dirty looking.Beds and bedding needed replacing. The unit was not stocked adequately - safe,tv,bbq tank missing(remedied eventually by Alegranza staff):kitchen was poorly equipped with insufficient dishes and accessories:dvd and speakers were not useable. Maintenance such as lights, flooring and other equipment was sorely needed. The complex of Alegranza was a luxury resort with nice grounds and amenities and great staff but ensure which unit you are getting. Saw D403 and it was a true luxury unit with nice owners. We are sorry for the inconvenience caused. As you might be aware, after hurricane Odile we have started a complete refurnishing all our Residences. Unfortunately the unit that you stayed was still on the waiting list to be refurnished and re-stoked (kitchen tools, linens, etc..). This was due to our high occupancy, and limited supplies still, after the hurricane hit, since all hotels were hustling to re-open. At this moment, we can commit to your that every single unit in Alegranza has similar furniture and equipment as the one you saw and liked so much (D403). We hope to welcome you again in Alegranza. given us numerous fond memorable moments from sunrise to sunset. Everything was 5 star. This excellent accommodation was equally matched by the unparalled courteous and accommodating staff. They are all true ambassadors not only for the Alegranza but for San Jose del Cabo. The dining restaurant was very reasonable in price complimented with superb food, wine, and again 5 star presentation and staff. San Jose del Cabo is without a doubt one of the best locations in all of Mexico. The quaint town, has everything you need. Clean, friendly with lots of choice in every regard.Not only will we return to San Jose del Cabo, but we cannot imagine staying anywhere but Alegranza. Thank you so much for such review about our unit in Alegranza.We hope to see you back very soon! Best from Los Cabos! Our 4 weeks at Alegranza were so relaxing. We spent many hours sitting on the huge balcony watching whales, boats, the fabulous panoramic view from Punta Gorday to Punta Palmilla and the birds from the estuary. Restaurant is excellent. Staff is helpful. Condos are huge, new and beautiful. Afternoons at the pools were so peaceful. Walks to el centro, the Cabo bus, Mega, Europea, Oxo, etc. were pleasant. The neighborhood is lovely. Appreciated the elevator to upper floors. Struggled just a bit with stairs in the pool area, but not impossible. We'll be back! Thanks everyone for making our visit so special. We have just returned from a month at Alegranza. We stayed in a three bedroom unit. The views were spectacular. The unit was very spacious and well furnished. Having an excellent restaurant on the premises was a big plus. The grounds were well designed and meticulously cared for as were the three swimming pools. The staff were all well informed, very courteous and helpful. Our month in paradise. My family just came back from our 10 day vacation at Alegranza and we really enjoyed it...what a views!. The resort has a great location(it's close from everything...you can walk anywhere), my kids enjoyed the pools, the Jacuzzis, the gym, the tennis court...we loved the restaurant which I think it was very reasonable in price and the service of the resort, as well as privacy, the quality of the finishes and details as well as the atmosphere . I can't wait come back next year ! !